Establishing a healthy lifestyle helps teenagers stay away from drugs; and sports plays an important role in a healthy life. Apart from enhancing the physical and mental well-being, teenagers can also establish social network, improve interpersonal relationships and foster spirits of co-operation through sports. 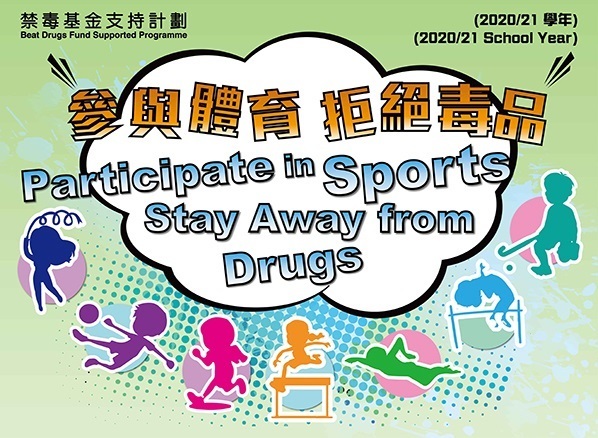 In this connection, the Narcotics Division, Security Bureau launched the “Participate in Sports, Stay Away from Drugs” Programme in the 2017/18 school year. The programme will continue to be implemented in the 2018/19 school year. All secondary schools in Hong Kong are welcomed to join the programme. The Hong Kong Schools Sports Federation has kindly agreed to be the supporting organisation of the programme. To promote healthy lifestyles and an anti-drug culture in secondary schools through students’ participation in the organisation of sports-related and/or health-related activities, and in supporting student athletes taking part in sports competitions. The programme is a school-based student-led preventive education initiative. The activities are to be designed, organised and implemented by students. The activities should incorporate anti-drug themes of “harms of drugs commonly abused” and/or “legal consequences of drug trafficking”. The Beat Drugs Fund (BDF) will provide funding for participating secondary schools to organise activities that can meet the objective set out above. to engage a group of students as Healthy Sports Ambassadors in the school to promote participation in sports with a view to developing healthy lifestyles and an anti-drug culture. to organise sports-related and/or health-related activities, such as exhibition and game booths, to bring out the message of staying away from drugs by establishing a healthy life. to invite students to shoot student athletes during sports competitions and exhibit the photos in the school with a view to encouraging students to support student athletes, enhancing their understanding of sports competitions and promoting healthy lifestyles. All secondary schools in Hong Kong are eligible. Each school can apply for a grant up to $20,000 for implementing the programme in the 2018/19 school year. All activities under the programme are to be designed, organised and implemented by students of the participating schools. Each participating school can nominate one group of students to be supervised by a teacher providing guidance and suggestions. There is no limit on the number of activities to be organised. All activities should be implemented and completed between September 2018 and August 2019. Upon completion of all activities, the final reports to be submitted by the participating students will be examined. Due recognition will be given to outstanding or creative projects. Each participating secondary school can nominate one group of students to submit one application. Applicants are required to complete and submit one original copy of the Application Form. Applications delivered by hand shall reach the office of the BDF Association (30/F, High Block, Queensway Government Offices, 66 Queensway, Hong Kong) at or before 6:00 pm on 11 June 2018. If applications are submitted by mail, the postmark shall be on or before 11 June 2018. Late applications or applications with incomplete information will not be processed further. For the purpose of considering the applications, the BDF Association may request applicants to submit additional or supplementary information. All submitted applications, whether accepted or not, will not be returned. Applicants may contact the staff of the BDF Association at 2867 5974 or 2867 5975 for any enquiries concerning the programme. Some publications are in Portable Document Format (PDF). Viewing and printing of them can be done through the use of the Adobe Acrobat Reader .